Simón Bolívar is the image in which Conservatism in Colombia creates its ideologies: the ideals of this great character were used by many years on the different conservative movements. 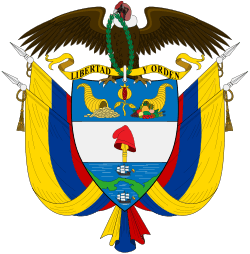 But the first formal party was created at the year of 1837, because of Jose Ignacio de Marquez and the image of Bolivar, it was known as "Republicanos Moderados". There did not exist a program, but they were believers of God, and liked Order and Control. On the year of 1840 there occurred a civil war that helped the perfilation of future parties, including the Colombian Conservative Party movement, principal representative of this ideal. Colombian conservatism, is an old ideal that believes in protectionism, and other ideals like being against totalitarism. Its history began with the creation of parties that represent conservatism on Colombia. But the strict difference that we may see with this conservatism toward the others, is the attitude it has toward, Protectionism, because many Colombian conservatives consider, it the unique solution for creating a fair market, between poor countries and the ones that are rich. Belief in a social stability. There have been many conservative movements, apart from the principal party. We may see "Conservatismo Colombiano" party. And others like Rojas Pinilla movements that was influenced by conservative ideals, other important movement was created by Nuñez it was a coalition between conservatives and moderated liberals, and it participate at some elections by the name of "Partido Nacional". The National Popular Alliance was initiated in 1960s by disillusioned conservatives and it later developed into a populist opposition party. Before the creation of the party, the members where called "Godos". This "Republicanos Moderados" and some other "radical conservatives" lead to the beginnings of the Colombian Conservative Party. (*)Presidents of Liberal origin which implemented conservative policies / but then become allied with conservatism.